There are heroes all around us….fighters and survivors who have taken on cancer and won! There are also those that lost their battles…taken from us too soon, but with permanent places in our hearts and our memories. On Saturday, July 29, the Bisons will honors those heroes that have won their battles and remember those that didn’t. As the team hosts the Louisville Bats (7:05 p.m.) at Coca-Cola Field, we ask your help to STRIKE OUT CANCER, presented by WNY Imaging Group with proceeds benefiting the Breast Cancer Network of WNY and the American Cancer Society. 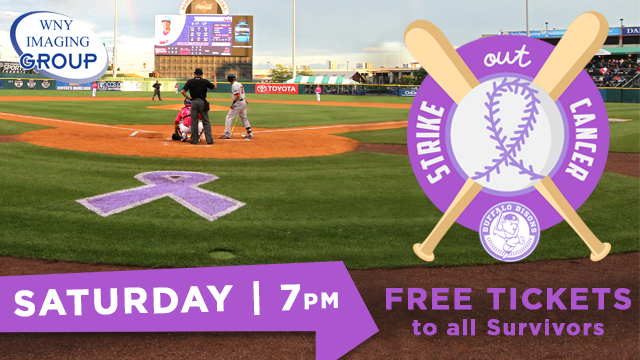 On STRIKE OUT CANCER night, we will honor ALL CANCER SURVIVORS with a FREE TICKET to the game. Just CLICK HERE by the end of the day on Friday, July 28 to register for your free ticket. One survivor will also be chosen at random to throw out the first pitch on Strike Out Cancer Night. On Saturday, we will also encourage all fans to WEAR LAVENDER in support of the fight against all cancers. Anyone who does will receive a FREE RAFFLE TICKET for one of a number of great gift items. Additional raffle tickets will be available at the game. You could win one of over 50 gift cards or a great piece of sports memorabilia such as a signed Rasmus Ristolainen stick, a signed Marcell Dareus helmet or a Jim Kelly signed photo and book. We’ll also honor all of the brave men, women and children who have fought, or are currently fighting against all forms of cancer, with a PLACARD MOMENT during the game. The entire ballpark will have the chance to stand up and show us who they’re fighting for by writing that person’s name on the placard. CLICK HERE for even more information on Strike Out Cancer Night. Receive great ticket offer when you help "2 Pack a Backpack"